Squash is one of Austin's favorite foods. He's tried all sorts squash: acorn, butternut, and even Kabocha. Ever since making the first baby-friendly pancakes a couple of weeks ago, I've been experimenting with different things to put into pancakes for our little guy. 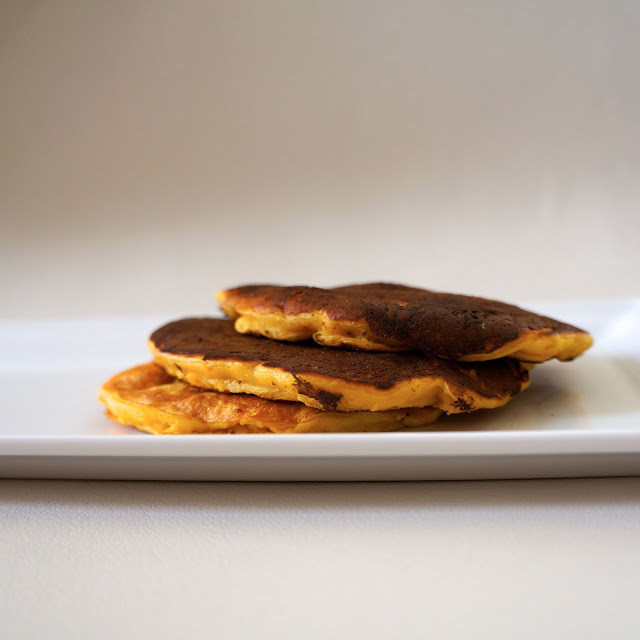 So, I thought why not try some squash with the pancake recipe. It was brilliant because he LOVED them. What did I expect? He loves pancakes. He loves squash. Of course, he would love squash pancakes. first mix the dry ingredients together. then add the wet ingredients. mix until combined. pour half the batter into a lightly greased non-stick pan over low-medium heat. cook for 5 minutes or until you can flip the pancake over. cook the other side for another 5-10 minutes or until golden. cook the rest of the batter same as above.